Dimensions 20W x 13H x 8D in. Contribute to the cause and save our environment with our recyclable non-woven custom printed tote bags. Manufactured with durable non-woven materials, our shopping tote bags are ideal promotional items. Order our reusable bags and imprint them with our logo, choice of clipart or special message. Excellent for those looking to get their brand name noticed, our personalized discount bags are certain to reel in a number of your target audience. In abundant color options these imprinted bags are certain to match your marketing theme and allotted budget. Customizing your reusable bags is easy with the aid our online tools. Simply follow the steps leading to the completion of your order and be sure to upload all files containing your graphics at the time of checkout to avoid further delays on your purchase. 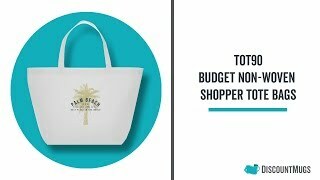 DiscountMugs.com promises you the lowest prices on all cheap wholesale custom printed shopper tote bags. Love them. Great bags and printing was amazing. The bags were even better than I expected. I will definitely be ordering again. Great bags...arrive on time and was a hit at our event. Thanks Sheila.